Looking like an exciting 2019! Another year has flown by! 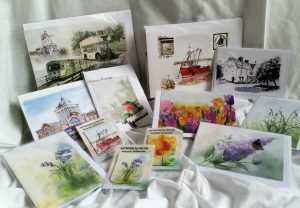 Most of my pictures are also sold as cards of various sizes. This is becoming more of a challenge as many of the new mediums, especially the shiny ones, are very difficult to photograph or scan but, problems are there to be sorted so…fingers crossed! All of my cards are blank for your own words which makes them suitable for all occasions. 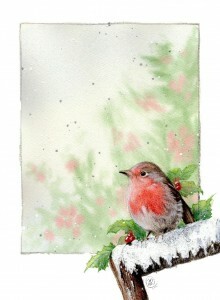 I also produce a limited number of cards with Christmas greetings on the front. Obviously, that means that I’m regularly attempting to come up with new and different winter pictures. Magnetic bookmarks are proving very popular too. I’m often asked to make more of them with suitable pictures for men so that is what I’ve been thinking about recently. There are some pen and wash sketches of Old Leigh which might be worth thinking about! I am also planning more of that type of work in the near future. I sell a selection of these cards and bookmarks at all of the shows that I do and at my various demo’s and workshops. I also now have work…paintings, cards and bookmarks, available at various localities. See Links page for details of Fenn Press. I do produce a calendar from time to time. Although I haven’t done one for a couple of years I have had a lot of requests so, perhaps soon? I often design cards by commission and am happy to discuss your particular requirements. © Copyright Helen Rubinstein 2012-2019. Made by Fenn Press. All Rights Reserved.